My nemesis, the kohlrabi, grows larger and more ferociously bushy. Although I still don’t enjoy its raw flavor, I’ve found I enjoy cooking it into almost any dish. Its leaves also taste lovely. I julienned the leaves, massaged them with lemon juice and sea salt, and baked them on top of a pizza. They added a crispy, baked-kale like flavor. Turnips have appeared in our last three boxes and are new to our palates. Since the turnip roots have a longer shelf life, I cook the green tops within a couple of days. My favorite preparation simmers them in an Asian-influenced concoction flavored with slivers of rendered Chinese sausage and hoisen sauce. The turnip greens become silky with a flavor that is a little earthy and a little bitter. Perfect for a girl who enjoys root vegetables’ greens more than the roots themselves. As for the turnips themselves, the smell of them raw reminds me of radishes. 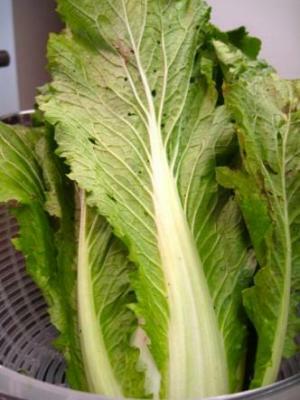 Like the greens, they have a slight bitter flavor, that it is mellowed when cooked. One evening, I patiently sautéed the turnips and carrots in local butter seasoned with dashes of sugar and salt until they were caramelized and sweet. The turnips faced a similar fate as the kohlrabi. They were cooked into nearly everything, from topping a pizza to simmering in red Thai curry. Chinese (napa) cabbageWe’ve managed to use-up our weekly allotments of vegetables, except for the green onions. Feeling stuck, I asked for assistance via Twitter and Brett Laidlaw of the blog Trout Caviar suggested incorporating them into dumplings. I immediately thought of the crispy mandu served at Korean Culture Camp during my childhood. They’re more like small, sesame oil-flavored eggrolls than traditional mandu. 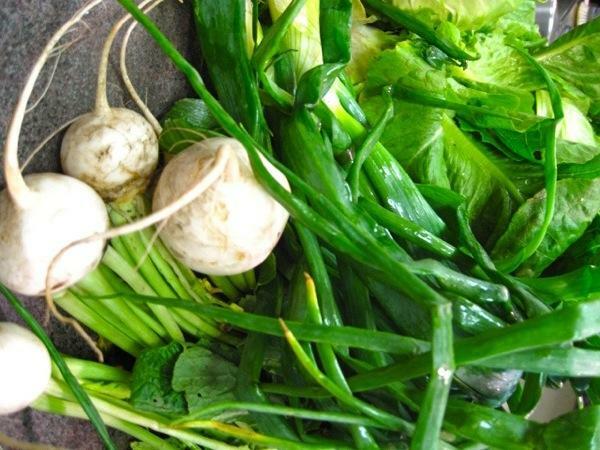 Nevertheless, they worked as a vehicle into which to stuff those bushy green onion tops as well as some Chinese cabbage. I enjoyed mine along with steamed rice, marinated CSA cucumber, and spicy chili bean sauce for dipping. Consider my recipes rough guides and adjust the seasonings as you please, tasting often. 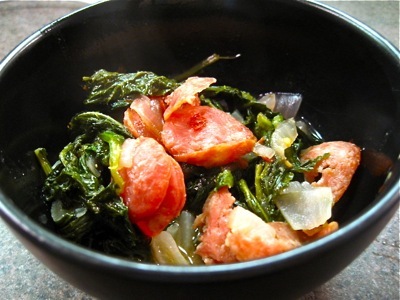 The turnip greens can be flavored with any cured meat such as bacon, while vegetarians could try seasoning with pickled vegetables, miso paste, or possibly preserved lemon. Wash turnip greens in a bowl of cold water, repeating if necessary. The grit will sink to the bottom. Chop into smaller pieces. Render thin slices of Chinese sausage in a hot pan. Add some chopped onion, salt, black pepper, (hot pepper, if you’d like) and a crushed garlic clove. Stir until fragrant and add the turnip greens. Saute until wilted and add about an inch of water or stock (you can cheat and add some bouillon). Season with some hoisen sauce and simmer until tender, and taste for seasoning. First, some notes about Mandu: Incorporate any meat or vegetable into the mandu. Vegetarians could substitute crumbled tofu or mock duck. The recipe makes enough filling for at least one package of wonton wrappers, found in refrigerated section of grocery stores. Make your own if you are feeling especially ambitious or have additional hands to help. I fried mine in a deep pot filled with vegetable. While I didn’t fry at an exact temperature, I just made sure the wontons sizzled when placed in the oil, adding a handful at a time. Then, I drained them well on paper towels. You could also bake the mandu on an oiled cookie sheet. Spritz the top of the wontons with your choice of vegetable oil and bake until crispy. Or, you could try the fry/steam method. Fry on each side of the wonton in a small amount of oil. Then add a splash in a splash of water, and cover for a few seconds until crispy. Recipe for Egg Rolls (Mahndu) adapted from a booklet tilted Korean Culture Camp Recipes, distributed in Korean Culture Camp, Minneapolis, MN, in the early-mid 90’s. Cook the ground meat, drain off fat, and set aside. Sautee the vegetables until tender but crisp. Combine with the ground beef and season with soy sauce, salt, black pepper, sesame oil, sugar, hot pepper, and cornstarch. Add small spoonfuls of the mixture to the wonton wrappers. Smear egg wash on two sides of the wrapper, and gently fold over and press to seal. 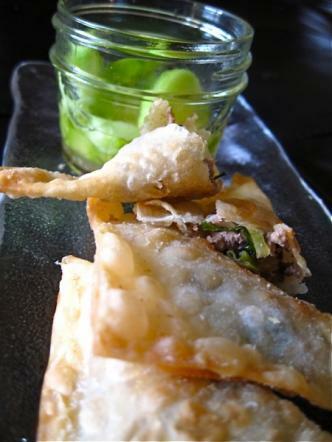 Place the filled wontons on a sheet tray covered with damp paper towel. Fry in hot oil and drain well. Slice cucumber. Place in a glass container and cover with equal parts water and white vinegar. Add grated garlic, minced ginger, and hot pepper. Season with salt and sugar. Let sit for a few hours to a day and enjoy. Jeni Hill grew up in the Twin Cities and recently moved to Fargo. 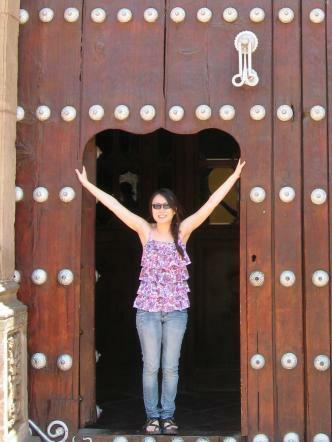 Her two sustaining passions are food and writing and she combines the two whenever she gets the chance. Jeni believes food is never just about the food and considers it the finest medium to connect with others. When she is not crafting contributions to Simple Good & Tasty, she may be posting to her blog An Herbalist Eats, 20food, or Fargo's High Plains Reader. 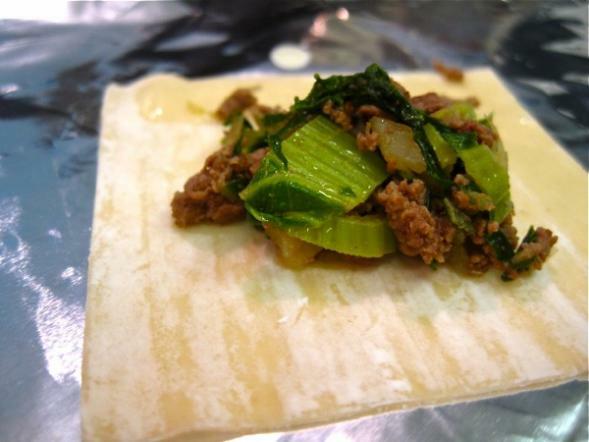 Her last non-CSA article for us was: An adopted Korean makes her first batch of lefse.